An experienced commercial litigator, Bríd has significant experience of financial services, fraud and insolvency related disputes and investigations. She has acted for Government Departments, Insolvency Practitioners and major Corporates. Bríd has been engaged by the Secretary of State for Business, Enterprise and Industrial Strategy and its predecessors for over 10 years. As a result she has extensive general investigation and litigation experience, including significant trial & Court of Appeal experience. She has been involved in leading a number of high profile and complex proceedings from carbon credits to MTIC/VAT fraud. 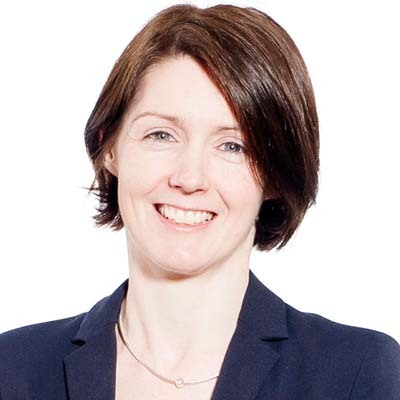 Bríd has extensive experience of leading a team on complex High Court litigation, often bringing together a team at short notice to meet client needs, demonstrating and fostering the motivation and multitasking abilities to meet demanding deadlines while leading a team and maintaining the highest of standards. Bríd is passionate about her work, results driven and cares about delivering the right result for the client. She is also keen to build strong and lasting relationships with clients promoting the progression of matters in a commercially pragmatic manner. Acting for a Brazilian Bank in protracted proceedings against a financier who brought about a crash in the Brazilian stock market. Advised on disclosure issues both here and also in Jersey. Advised and progressed a successful NPO application in Jersey which resulted in the Client securing some US$10million assets previously out of reach, due to complex trust and corporate structure, set up by financier and connected entities. Acting for multiple Liquidators in respect of release of assets stranded in complex trust structures. Investigated and progressed a successful application at Court which resulted in a pro forma sale process to enable the sale of Verified Carbon Units (VCUs) on behalf of the Liquidators, acting as Trustees. Liaised and tendered with various MNCs for the sale of VCUs on the APX Registry in the US. Currently in the process of identifying individual investors who were mis-sold the VCUs at hugely inflated prices with a view to eventual distribution of sale proceeds. Acting for the Official Receivers of Public Interest Units on VAT fraud. Investigating various companies including telecoms, metals and diamonds on complex extra territorial VAT Fraud. Liaising with HMRC VAT Officers and Specialist HMRC MTIC Officers. Drafting of multiple complex statements and issuing and progressing proceedings at Court through to conclusion. Advising liquidators on breach of duty, wrongful trading and/or fraudulent trading and asset recovery. Conducting interviews and enquiries, pursuant to s236 of the Insolvency Act, 1986. Issuing and progressing claims under Insolvency Legislation through Court. Acting for Official Receiver in respect of pension fraud and trust structures and sale of assets. Acting for the Secretary of State for Business, Enterprise and Industrial Strategy (BEIS) in some of the highest profile proceedings to come before the Courts ranging from multi million pound MTIC VAT frauds, pension fraud, carbon credits, landbanking and pension liberation fraud. Dealing regularly with matters of "public interest" and duties of fairness. Regularly advising on difficult and complex costs hearings arising from DQ proceedings. Acting for BEIS in respect of an accounting irregularities fraud, which resulted in an estimated £64 million black hole in the Group Companies' accounts, orchestrated in order to draw down funds pursuant to banking covenants. Advised on a successful Application to issue a Claim out of time given the public interest nature of the proceedings. Instructed and liaised with forensic accountants and procured primary evidence from the Liquidators and additionally key individuals from the finance department, including the former FD who we successfully issued Directors Disqualification (DQ) proceedings against and procured a higher bracket disqualification order. Acting for BEIS in SoSBEIS v Steven  EWHC 1331 (Ch) and successfully obtained a disqualification order. The Judgment of His Honour Judge Russen QC dealt with a number of matters in reaching his decision; from the misconduct complained of, the evidential burden, and extenuating circumstances which may impact or even deflect the court from a finding of unfitness. Advising the Client which lead to the decision of In Secretary of State for Business, Innovation & Skills v Potiwal  EWHC 3723 (Ch), where the court considered issues of res judicata, privity and abuse of process. Court decided in Client's favour that relitigation of issue may be abuse of process even in absence of privity (High Court). This has been a key decision for in terms of efficiencies in progress claims which are fully contested. Acting for the Secretary of State for BEIS and advising on parallel criminal proceedings and the issue of privilege and disclosure in such circumstances and generally advising on privilege in the cross over between third party advisors and companies in liquidation or dissolution. Advising on inadvertent waiver of privilege and privilege in corporate structures. Acting for the Secretary of State for BEIS on Excise and VAT Duties fraud and the cross border element in respect of the importation of alcohol. Acting for the Secretary of State for BEIS in a number of high profile claims for directors disqualification, including the successful disqualification of Kevin Maxwell. Currently advising Secretary of State for BEIS and progressing a number of matters through to Trial involving former directors where Claims for a disqualification order are being pursued by the Secretary of State for BEIS in respect of persistent breaches of Home Office Immigration and Enforcement legislation. Investigating a complete range of industries from Pensions, Jewellery, Motor Industry, IT, Telecoms, Insurance, Real Estate, Food & Beverage, Steel and the provision of Educational Services, for the Secretary of State for BEIS in respect of proceedings and various applications pursuant to the Company Directors Disqualification Act, 1986. Examining books and records and interviewing directors, employees and third parties to advise the Client on whether it is in the public interest to progress DQ claims. Involved in various ancillary applications such as leave to act notwithstanding a disqualification order, adjournments of trials, stays, strike out, service applications (out of the jurisdiction and alternative) and appointment of various experts. Liaised with professional witnesses, HMRC Officers, Insolvency Practitioners and lay witnesses through to the conclusion of trials. She is used to dealing with complex frauds, and procuring evidence from members of the public who have been the victim of such frauds. Acting on various contractual disputes with national and multinational clients, advising on interpretation of clauses, breaches and termination of contracts, and generally in respect of settlement. Acting for a multinational client in respect of the Commercial Agents Directive and compensation due. Considered and advised on terms arising thereunder.